Books these days are turning out to be a waste of time and space. Nearly nobody has the time to read anymore. Out of a survey conducted amongst 3500 Singaporeans, only 20% read! For university students – it’s a whole different story. With so many readings, assignments, midterms, finals (the school even brought in a sleeping pod for us at the Lee Wee Nam Library! ), nobody really has the luxury of time to read. When one thinks about the act of reading, English majors normally come to mind. But they too struggle with having to babble Shakespeare in their dreams. Well, is time the only constraint? Or are we no longer interested in stories? Definitely not. The generation which made the Harry Potter Series into best-sellers can’t be disinterested in stories. 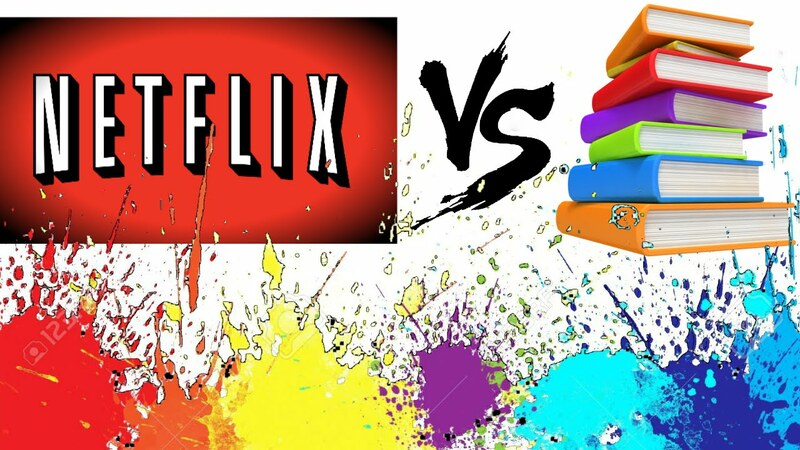 The true question is: are you team Netflix or team traditional? The great book vs movie debate has been going on for years. If the story you want to read has been made into a popular show, why bother reading the book? After all, it is still the same story. But here comes the point where many others beg to differ. Books provide intimate details and many character intricacies that films and TV shows simply cannot recreate, no matter how superlative the actors’ performances are. For example, The Godfather by Mario Puzo took years to write and publish. The novel consists of nine smaller volumes within itself. Each volume beautifully describes the perspectives of different characters in the same situation, thus exposing different vantage points. Characters who are insignificant in one volume can have an entire volume dedicated to them later on. The movie adaptation won many accolades for its sublime portrayal of characters by the actors and its supreme cinematography. Yet, the movie only depicts one character’s opinion throughout. After all, how much can one show in three hours? There were many other characters who were put in the back burner and some weren’t even shown. By doing justice to one, it failed to do justice to so many others in the process! Books also lie in the power of words itself. Words can be mesmerising, transporting people to different lands and continents, all in a second. One day you can be fighting Greek monsters with Percy Jackson, and the next day you can enjoy a nice cup of tea at 221B Baker Street. Words can also slice through hearts like knives and there’s no antidote for those wounds. They are immortal and undeniable – eternally spellbinding. Most importantly, books create memories. Different books evoke different emotions. Everybody gets their thinking cap on while reading an Agatha Christie novel and people are bitten by the laughter bug while reading P.G Wodehouse. The memories books create are like a honey elixir, making people come back for more. So will books ever die out? Some would say yes, some would say no. But one thing remains clear: the impact books left on millions will stay on for years to come and more. So, now that the holidays have come, why not pick up a book and jump into a whole new world? What do you think about the great book vs movie debate? Share with us your thoughts below in the comment section! Next articleCampusUnion Town Hall: Your Questions, Answered by NTUSU!